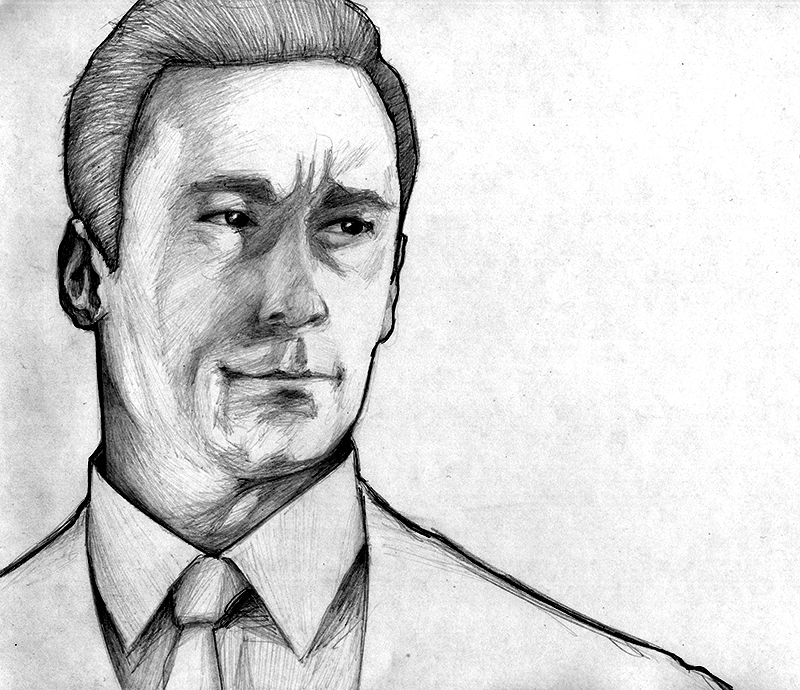 Here’s my latest Mad Men drawing. After my drawing of Joan Holloway I decided to take a stab at the main character, Don Draper. For those of you who don’t watch the show, it’s set in the 1960’s. Don Draper is the Creative Director at the Sterling Cooper Draper Price advertising agency. Essentially, this guy is the man. He’s the suave, debonair type that all the women seem to fall all over. Even so he has serious problems to contend with, not the least of which is the struggle to come to grips with his very identity. One of the best parts of this show is watching how he comes up with the answers to the creative problems that his clients are dealing with. Another thing I find really intriguing is that he was married to this coldly beautiful, kind of flighty, immature woman who had no real substance to her. Of the many women he cheated on her with (every man on the show cheats on his wife), they were all some type of very independent woman who was really intelligent and really bringing something strong to the table. You could tell that’s the type of woman he really was attracted to but he just doesn’t ever seem to end up with any of them. I tend to debut the raw pencil art on my Facebook page, so head over and “like” that page if you want to see this stuff early. This is another instance where I feel I didn’t quite hit the mark on the likeness of Don. Even though I think I did a better job that with the Joan drawing, I’m not exactly happy with this one. I’m just gonna keep drawing these and posting them until they hit a level of quality I’m satisfied with. 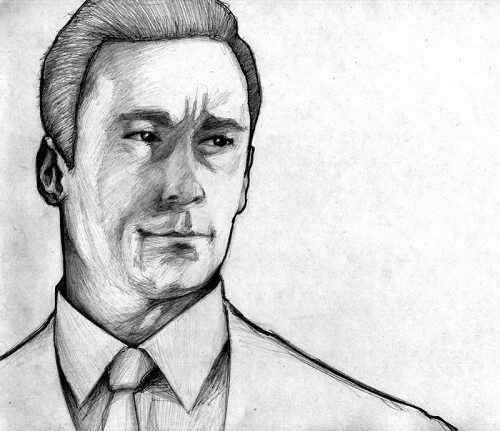 I’m working on Roger Sterling next, and so far it’s shaping up to be a pretty good likeness. Here’s hoping I don’t ruin it! Previous » The lesson I learned from Tron: LegacyNext » You can realize your creative dreams – just ask The Trashmaster! You are incredibly talented JG! Lovin’ the work. I’ve got a project I want to hire you for. Thanks for the compliment Marlee. Is this your first comment on my blog? This is a very special day, indeed! Yeah just let me know when you have something for me, let’s do this thing in 2G11! Did you know that you have an awful lot of D sounds in your title? Drawing of Don Draper is actually really hard to say three times fast. It’s almost like that third D takes it to a whole new level. Damn damn damn…you’re right, I couldn’t do it. Why isn’t there a setting in Scribe SEO to warn against this?! I can’t say I’ve ever seen Mad Men, but if I had I’m sure that looks just like him. :D I do envy people who can draw like that. But then I too have my own talents… we can’t do it ALL can we? Thanks Allan! True we all have our special talents, and there’s other things that I envy too, like those super-smart scientist type guys. 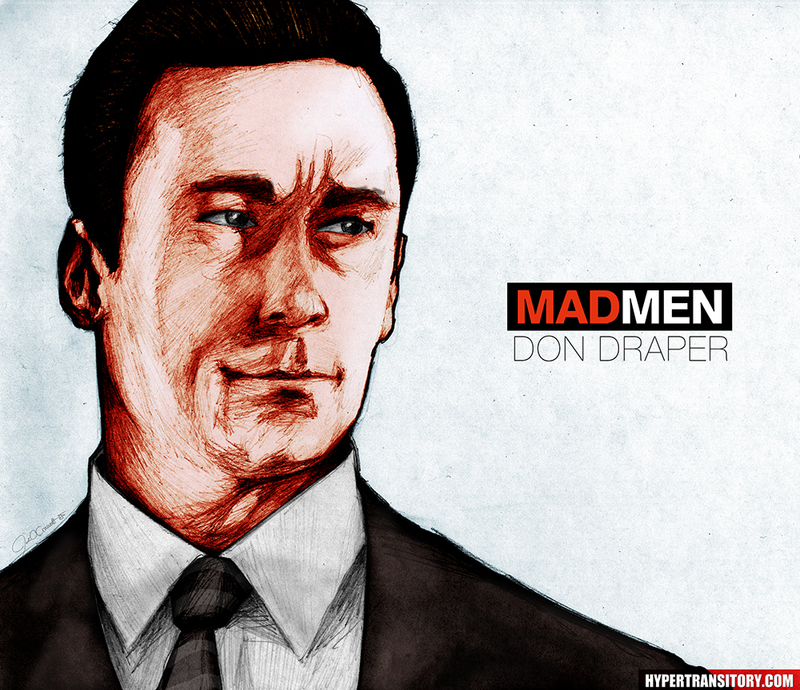 I think you nailed the physical resemblance as well as the Mad Men “feel” in the portrait. Thanks much, papalogic. I felt a lot better about this one than the Joan drawing. I’m working on Roger now and that one is coming along pretty good! You have the talent! Very beautiful drawing, and your strokes are clean. I appreciate it. It’s my first time here, I’ve seen you on Brankica’s blog and I am glad I found this. Thanks! Well I will be sure to thank Brankica! And thank you for the compliments and for taking the time to leave a comment. peace! Your drawing is awesome! And the story behind it as well. I enjoyed reading it and bonus the beautiful drawing. Oh, I just hope I have that talent too. There’s a lot of things I want to draw. You have such a talented hand, keep it up. It’s a god given gift and you should be thankful of your talent. Many people wishes, they could draw or paint, like me ;-), but sad to say I can’t do it. Anyway, this is a wonderful post, and thank you for sharing your talent. Hope, I could see more sketches on your site. Hey Greg, thanks for the compliment! Nice drawing. When did you start drawing? you have awesome hand!keep up the good work.I will look forward for your new drawings. Amazing picture! EVERYONE tells me I have to watch Mad Men…and I love the concept and time period it takes place in, but I just haven’t gotten around to it, and at this point it’s been on for a while…I think I’ll rent it and catch up someday, but for now I get my tv fix with The Office…and GLEE! Yeah do yourself a favor and catch up on Mad Men before it comes back this March. I didn’t think I would like it but it struck a chord with me right away. I definitely recommend!